This Sunday I decided to spend the day outside with the dog. 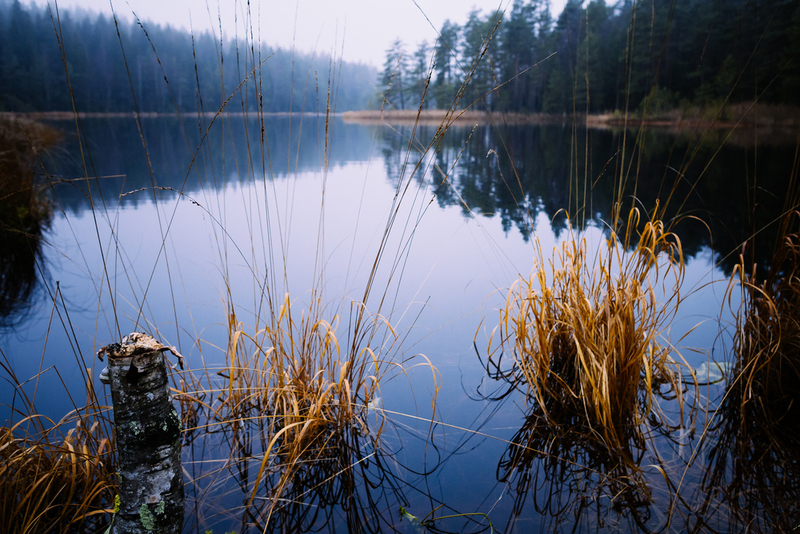 Since I didn't want to drive far, I went to Nuuksio National Park which is about a 50 minute drive from Helsinki. Looking at the trail map, there were two ring trails that seemed interesting: Haukankierros (4km), which seemed to be more scenic but a bit shorter, and Korpinkierros (8km) which was just the perfect length. As Korpinkierros shared some of the same trail with Haukankierros, it was my trail choice for the day. You can read more about the trails in Nuuksio here. All the ring trails start and end at the Haukkalampi Information hut. There's also a parking area where you can park your car for easy access. Because of the close vicinity to Helsinki, good trail conditions and easy access, the trails are pretty busy with other hikers especially during the weekends. I arrived at the late afternoon and was met with a lot of people already leaving. But even then there was a steady stream of traffic for almost all the way through the first half of the trail. A bit too busy for my taste. I might want to try to come back during the week to see if it's more quiet then. The trails were clearly marked and almost impossible to wonder off but the recent heavy rains had made them muddy, and at times formed streams across the trail. You will definitely need some hiking or other waterproofed boots with preferably good traction on slippery surfaces. 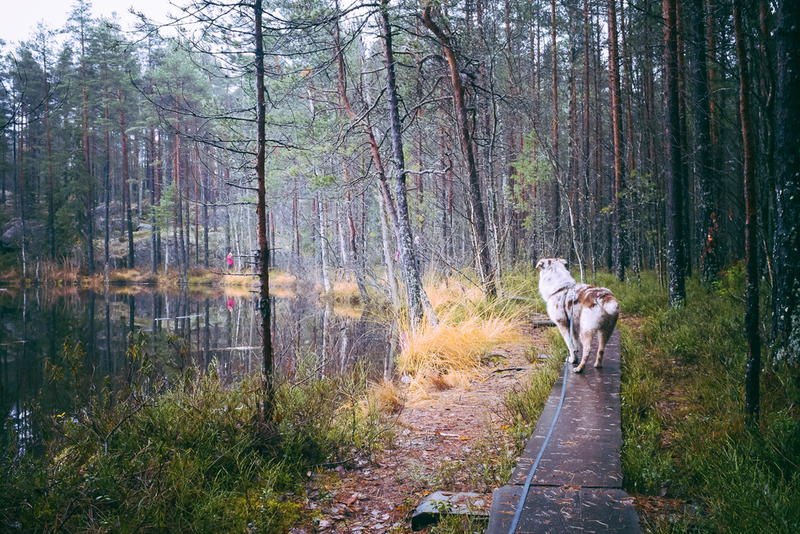 As with every National park in Finland, dogs should be kept on leash at all times. This is a bit frustrating as Fire gets so excited when we get on the trail that he just dashes all over the place, bursting with energy. To give him some room to run and wander, I keep him on a Flexi Giant L which is an 8m (26ft) long retractable leash. It works well on open areas and in places where there are not a lot of trees and turns on the trail. To make walking on the long leash easier, I've taught Fire "left", "right" and "straight" commands. This steers him into right direction and helps to keep us both on the same side of the trees. But even with this, at times the trail became so narrow I had to reel him in to avoid getting the leash all tangled up in the brushes. In the more open areas, I hook the leash to the hip belt on my backpack for "handsfree" hiking. This works well if you can control your dog but should be avoided if your furry friend has a tendency to dash off or run over the leashes length as this will cause some very nasty face-plants. The first part of the trail is littered with beautiful scenery as the trail crisscrosses between small lakes and green hills. At times you can hike along the boardwalks to get over the bogs and wetlands. On the way in, I noticed a fireplace where I planned to eat as we got back from the ring trail. I thought we had ample time to do the hike and come back before the dark but with the autumn, the darkness came so early and so quickly that we barely made it back. The minute we reached the fireplace, the darkness surrounded us and you couldn't see a thing. While I was setting up my Trangia, I heard a familiar voice among the few people already on the fireplace. I looked up and saw an old friend from work who was there with his family. We worked on the same team for almost three years so it was really nice to see him again. We sat by the fire, drank some hot chocolate and talked for awhile. Their kids made sure that Fire was well fed with sausages and he didn't complain. It was nice ending the hike with some familiar faces and good company. We parted ways in the darkness and while driving back, all I heard was a steady stream of snoring from the backseat. The dog was happy.